Sebastian Wright, 12, of Milton examines a flat for the queen bee. Some youngsters want dogs, others prefer cats, and then there’s the Milton lad who’s devoted himself to raising an entirely different sort of creature. 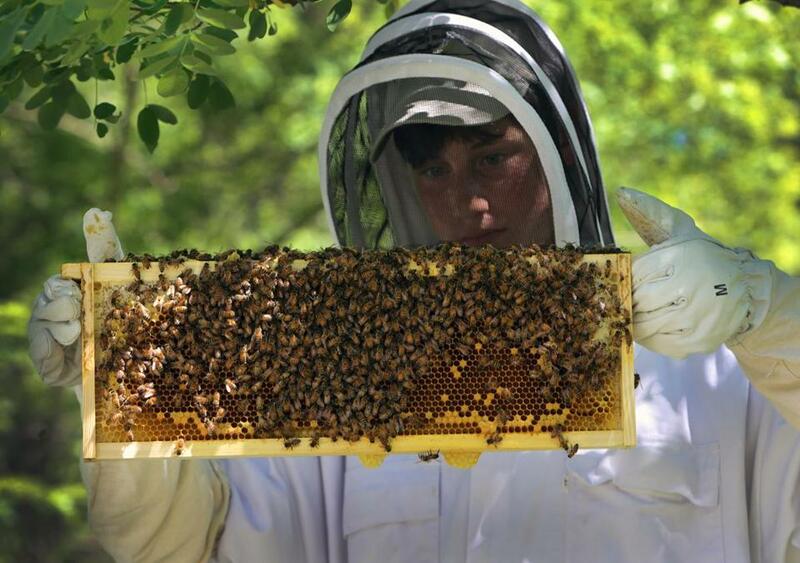 For the past three years, Sebastian Wright, a 12-year-old who just completed sixth grade at Pierce Middle School, has worked with his parents to install and maintain beehives across town. Each of the wooden structures — he’s now up to 13 — can house up to 60,000 bees and can cost upwards of $800, said Michelle Lee Urbano-Wright, Sebastian’s mother. “It’s just one of the things I do: school, soccer, bees,” said Wright, co-founder of Milton’s Billion Backyard Bee Project, matter-of-factly. Although the goal of creating homes for a billion bees is only figurative, he said, the problem he’s attempting to tackle is quite real. For at least a decade, research has shown that although the number of beekeepers is on the rise, more honeybee hives are failing each year, said Victoria Wojcik, research director of the Pollinator Partnership , one of the largest North American nonprofits focused on the decline. A quick primer on how to build a beehive. The Agricultural Research Service at the US Department of Agriculture estimates that these insects play a role in producing about one-third of all food Americans eat, adding at least $15 billion to the country’s agriculture market through increased product yield and higher-quality harvests. Wojcik said that although losing these pollinators would not cause a major food crisis, the availability of produce would plummet, inevitably raising the cost of tomatoes, melons, almonds, and more. Wright came face to face with the crisis three years ago when his first hive collapsed, he said. But he didn’t give up. Instead, motivated by curiosity about what caused the extinction, he came up with the idea of the billion bee project. He said the campaign’s goal is to spread awareness about the importance of the pollinators and encourage people to become beekeepers. Wright is also working to deter locals from using pesticides that can wipe out entire bee colonies. He suspects that’s what happened to his first one. The Globe reported in March that that many beekeepers across the state feel agricultural officials have failed to recognize the severity of the crisis for bees — and humans. 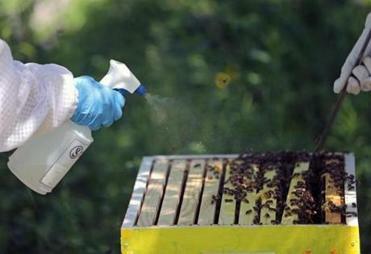 The state’s Department of Agricultural Resources had released a plan at the time listing pesticides last in a long list of potential causes for the decline in the state’s bee population. Beekeepers across the Commonwealth were enraged. Not everyone agrees pesticides have been the prime bee killers. A draft of the Massachusetts Pollinator Protection Plan provided to the Globe by the state’s Department of Agricultural Resources lists a wide variety of factors contributing to the decline in bee populations, including parasites, disease, habitat loss, and climate change, to name a few. The plan also recognizes colony collapse disorder as a factor. Federal officials acknowledged that phenomenon beginning in 2006, when beekeepers reported unusually high losses of adult bees in the spring and summer. Hives affected retain their queen, immature bees, and honey, but the adult bees go missing without a trace. No direct cause has been established. Wojcik, the Pollinator Partnership research director, puts the blame squarely on the use — often misuse — of pesticides near urban, residential, and agricultural beehives. Although such products are designed to kill bugs outright, she said that’s rarely the case with bees. Minimizing use of pesticides, or using them according to instructions and when plants aren’t budding, are practical ways to improve numbers, said Wojcik. But the best way to help, she continued, is to do exactly what Sebastian Wright is doing: establishing more beehives and educating people about how to encourage bee health. Wright said he hopes to install 20 hives across Milton before his work is finished. To accomplish this goal, he and his parents are selling honey that their bees produce, spreading the word about the role these pollinators play in our ecosystem, and educating people about how to help reverse the steady decline in bee populations. 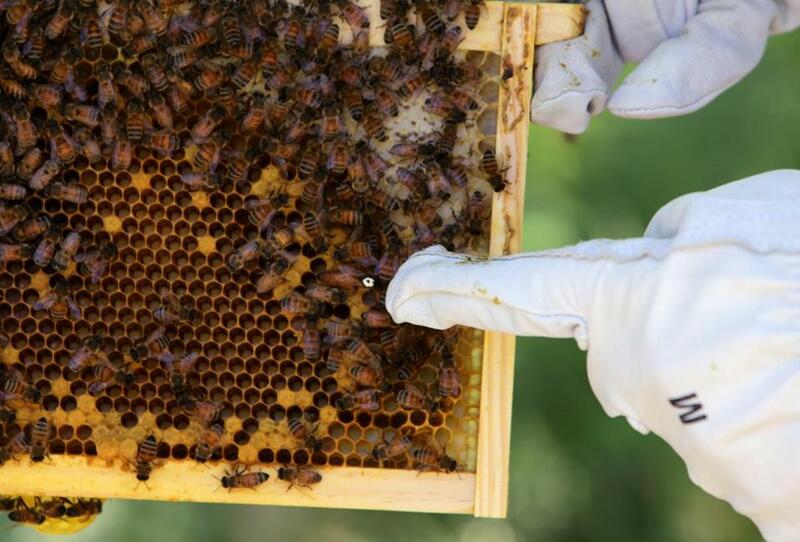 Most recently, the project installed two hives in a fenced-in corner of the New England Base Camp, a Scouting-affiliated site in the Blue Hills Reservation that attracts 15,000 visitors a year. The two new hives were funded in part by the Fruit Center Marketplace, a family-owned food business with stores in Milton and Hingham. At the camp, manager Darrin Johnson said he hopes the hives will provide a valuable learning opportunity for the thousands who attend each year. For more information about Milton’s Billion Backyard Bee Project, visit www.facebook.com/miltonbillionbees. Sebastian Wright of Milton points out the queen bee, which is marked here by a white dot for easier identification. Bret Hauff can be reached at bret.hauff@globe.com. Follow him @b_hauff.